Warning signs are flashing red around the world. Germany is the industrial center of Europe. As Europe’s largest economy, it accounts for nearly one-third of eurozone GDP. Germany recorded lackluster growth in 2018. Its GDP grew 1.5%, down from 2.2% in 2017. That’s the country’s slowest growth rate in five years. The end of the year was especially painful. In Q3, Germany’s GDP shrank by 0.2%, the worst quarter in five years! In the last quarter, Germany posted zero growth, narrowly avoiding recession. There are a few reasons for the slowdown. First, the eurozone is slowing as a whole. But the key problem is the trade spat between the US and China. Germany is China’s fourth-largest trading partner. No question, Germany is very dependent on trade with China. And the Chinese economy has certainly been falling. The past 12 months have been tough for China. The trade war with the US has taken a toll on the Chinese economy. The Shanghai Composite Index lost 25% of its value last year. That placed it among the world’s worst performers. The trade dispute and tariffs have also started to show up in Chinese economic numbers. In December, the country’s exports fell 4.4%. That’s the largest drop in three years. And the slowdown shows no sign of stopping. Last month, China’s exports fell by 22%! Meanwhile, China’s GDP growth has fallen to 6.4%, the lowest level in over a decade. The falling Chinese economy is a symptom of a global economic slowdown. And the US isn’t immune from it. Compared to its peers, the US is in a pretty good position. Economic growth is decent while unemployment and inflation are low. However, recession fears are growing. A Bloomberg survey pegged the likelihood of a recession in the next 12 months at 25%. That’s the highest reading in six years. Others are seeing warning signs, too. 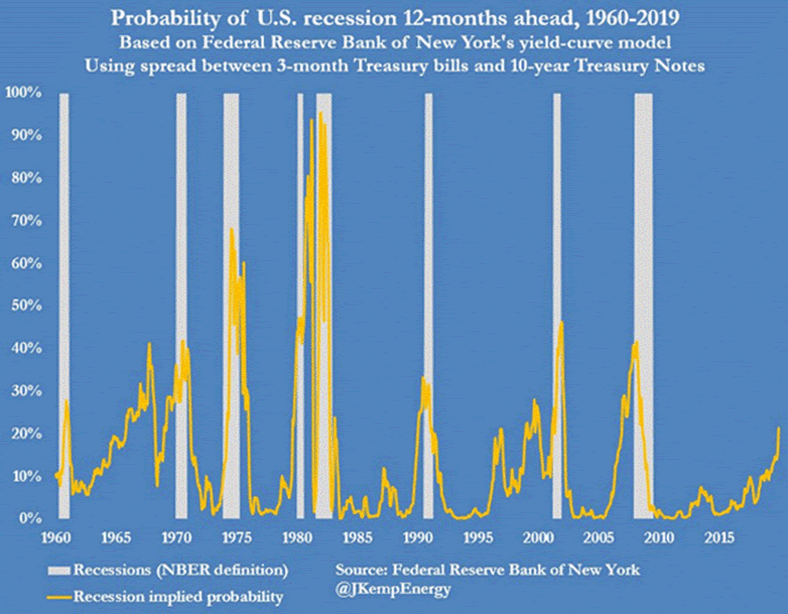 •The odds of a recession have doubled in the last year. •The recession reading has not been this high since 2008. •The world’s three biggest economies are struggling with a set of economic issues. As risks grow, it’s time to move into the safest market in the world: US Treasury bonds. Even if the US, Germany, and China fall into recession, US government bonds will perform well. See, when investors need a place to hide, they flock into government bonds. That pushes their price higher. That’s why these bonds are known as “risk-free” investments. The timing now is also good. We seem to be at the top of the Fed’s hiking cycle, so the yields are very appealing. This is especially true for short-term government bonds. The gap between long-term and short-term bond yields has been shrinking for a while now. This is known as a flattening yield curve. That happens when investors grow pessimistic about the future. So while long-term bonds yield a bit more, the difference is not worth the extra interest rate risk. For this reason, I choose to buy shorter-duration bonds. One of my favorite bond funds is iShares 1-3 Year Treasury Bond ETF (SHY). This bond fund has a yield of 2.3% and a low expense ratio of 0.15%. Next on my list is the SPDR Barclays Intermediate Term Treasury ETF (ITE). This bond has a higher yield of 2.4% and a lower expense ratio of 0.10%. It yields more because the maturity on the bonds ranges between 1 to 10 years as opposed to 1 to 3 years for SHY. This means you assume a little higher interest-rate risk. Lastly, I’m a fan of the iShares 0-5 Year TIPS Bond ETF (STIP). This fund offers a 2.4% yield on a very low 0.06% expense ratio. STIP is different from the other two because it holds Treasury inflation-protected securities, also known as “TIPS.” These bonds pay a fixed interest rate that is adjusted with the inflation rate. All these bond funds will insulate your portfolio from a global slowdown while earning you a steady and safe income. I highly recommend adding them to your portfolio before the next recession hits. My brand-new special report tells you everything about profiting from “sin stocks” (gambling, tobacco, and alcohol). These stocks are much safer and do twice as well as other stocks simply because most investors try to avoid them. Claim your free copy.